Go ahead. Name the third member of the "Production Line." Sure you can name Gordie Howe. Most of you could name Ted Lindsay too. Give up? The answer is Sid Abel. While Howe and Lindsay brought a mixture of styles and aggression that would intimidate their opponents, Abel's creativity and savvy was the backbone of the line and of the Red Wings. But don't think he was soft. He could hit as hard or be as abrasive as his line mates. The intimidating "Production Line" was without doubt one of the greatest combinations in hockey history. To illustrate just how good they were together, in 1949-50 they finished 1-2-3 in the scoring race. Lindsay had 78 points, Abel had 69 and Howe was third with 68. It can be argued that Abel, not Howe, Sawchuk, Lindsay or Kelly, was the backbone of the great Red Wings team of the 1950's. Hockey historian Ed Fitkin was once quoted as saying "Sid will go down in the Red Wings' history as the greatest competitor and inspirational force the Red Wings ever had." While with the Wings, Abel helped lead the team to the Prince of Wales trophy 5 times as the best team in the conference. 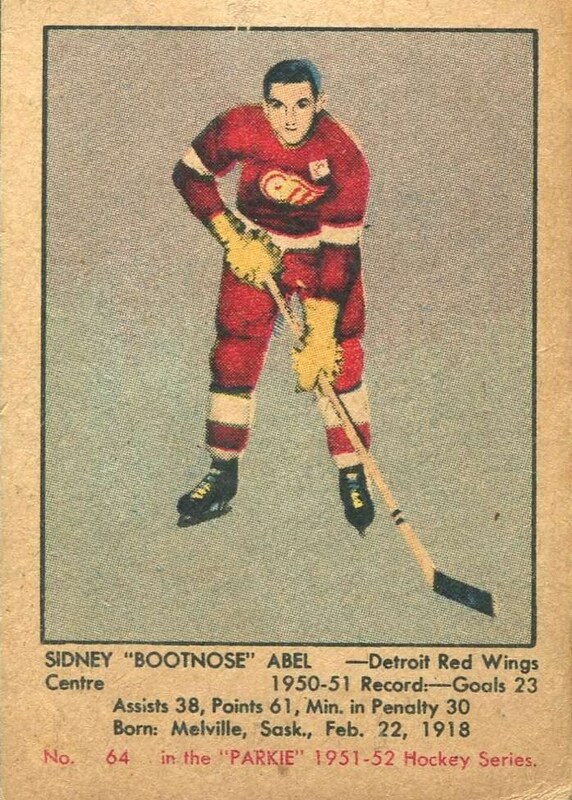 In 1942 Abel, affectionately nicknamed "Old Bootnose," was named to the Second Team All Star at left wing. In 1949 and 1950 he was named to the First Team All Star at center. Abel was the first player to attain All Star status at two positions. Also in 1949 Abel won the Hart Trophy as league MVP. In 69 games he would lead the league in goals scored with 28. 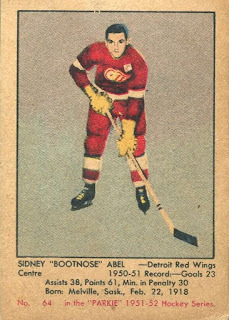 Detroit won the Stanley Cup with Abel's leadership in 1943, 1950, and 1952. Abel delivered the 1943 championship before the arrival of Howe, Lindsay and Sawchuk. In 1952-53 Abel was released from the Red Wings and signed on with the Chicago Black Hawks as a playing coach. He took over a pathetic team that finished dead last in five of the previous six seasons. Yet "Old Bootnose," with the help of 1954 Hart Trophy winning goalie Al Rollins, turned the Hawks around, and into the playoffs. They would go on to take the powerhouse Canadiens to seven games in the semi-final before finally bowing out. Abel would return to Detroit as coach in 1958 and would become GM in 1963. He would remain with the Wings until 1971 when he would sign on to coach St. Louis. He would later become a long time hockey broadcaster. Abel would rightfully be inducted into the Hall of Fame in 1969. Dit Clapper was an all star at 2 different positions, RW and D, before Sid Abel. I think Neil Colville may have been also, at C and D.
Sid Abel, the first great Jewish star in the NHL, and maybe the only one, except for perhaps Matieu Schneider.